His early solo efforts in the ‘90s were interesting, particularly when he shed the idea of stylizing everything to death and let himself write clever hook-and-vague-message songs but, at the time, the very bands he influenced such as Oasis and Blur were taking the muscular Britpop formula to new heights – perhaps doing what Weller should have done. After a while Weller seemed resigned, if not content, to slip uncomfortably back into his bespoke suit and go around the block again from time to time. However in 2008, I got an earful of his double album 22 Dreams, a strange hybrid of folk and pop-rockish stuff punctuated by appropriate, atonal noises. It was weirdly wonderful, mainly because it was unexpected, as was 2010’s Wake Up the Nation which also genre hops, flaring impressively when Weller dips into British beat mode. Weller’s new release, Sonik Kicks shuffles the deck of cards he was playing with on those previous two, impressive albums and comes up with another fresh hand. Psychedelia, power pop, borderline-cringy ballads and crisp electronic rock numbers make it an eclectic mix of excellence and tolerable experimentation. There is nothing revolutionary or even remotely avant-garde about the 14 song offering, but it’s enthralling to hear traditional structures and melodies being pimped by trippy production concepts and embellished by Weller’s largely understated delivery. His distinctly expressive, though limited-in-range voice sits back in the mix where it belongs and the songs become sound experiments rather than characterless delivery vehicles for the melody. From the synth and bass guitar throb of the opening song, Green, to the rather cutsy but charming daddy-loves-ya final track, Be Happy Children, Sonik Kicks comes at you from different angles. Pleasingly Weller seems at ease with ball busting or balladeering – the careful and beautiful By The Waters employs an acoustic guitar and orchestral arrangement worthy of Andrew Bird and the best of Duncan Sheik. Some of the songs feel oddly Jam like: the chanting, rolling (pure pop) qualities of That Dangerous Age, the bass driven three-chorder Around the Lake and the effervescent riff-short verse-riff snapshots in The Attic are remnants of a more direct Weller period. A few songs fight hard to work — the long-ish but engaging Study in Blue floats dreamily then somewhat pointlessly in a dub reggae hue while Dragonfly is a cool lyric but never arrives musically. As they have over the last few recordings, Noel Gallagher and Graham Coxon have brought their respective Oasis and Blur chops to the Weller party and their influence is in the album’s ether. More front and center is the aesthetic of producer Simon Dine, of the briefly impressive The Noonday Underground and a northern soul devotee. Weller fell out with Dine recently (over money of course) ending a relationship that seems to have been positive if not crucial for the rock star’s recent renaissance. 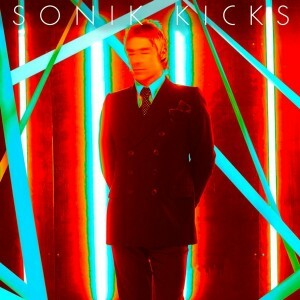 Hey, ‘That’s Entertainment’ Weller has indicated, insisting he is ready to move on, though the consistently interesting quality of Sonik Kicks and the previous two albums has been the adventurous song presentation, rather than Weller doing anything decidedly different musically. How much Dine, a co-producer with the artist, had to do with that might determine whether 53 year-old Weller, who has a likely British No. 1 with Sonik Kicks, continues to surprise and delight in the future, but for now the legend, deservedly, grows. Sonik Kicks releases in the US March 27. Weller plays New York May 18th and 19th. This entry was posted in Music and tagged Blur, Mods, Oasis, Paul Weller, Review, Simon Dine, Sonik Kicks, The Jam, The Style Council by Greg Truman. Bookmark the permalink.